By	Matthew Sloane. Last edited by Marios Alexandrou on January 28, 2019. While vacationing in Edmonton, Alberta's provincial capital I spent a day exploring nearby attractions like the Ukrainian Cultural Heritage Village. This living-history museum, with 30 authentic buildings, is unlike any we've ever visited. The interpreters portray real people of the era, vividly depicting Ukrainian immigrant life in eastern rural Alberta from about 1892 to 1930. While you're there, try the traditional Ukrainian pirogies (pan-fried dough stuffed with meat, cheese or vegetables). They're delicious! 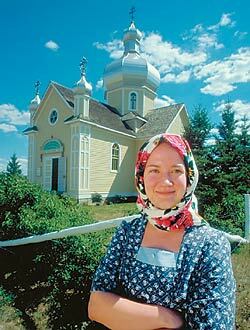 The Ukrainian Cultural Heritage Village is located about 30 miles east of Edmonton on Trans-Canada Highway 16, less than 2 miles east of the entrance to Elk Island National Park; watch for signs. It's open from 10 a.m. to 6 p.m. daily from the weekend of Victoria Day (celebrated on the Monday before May 25, which is May 24 in 2004) through Labor Day, and weekends only from then until mid-October. Admission is about $6 for adults, $3 for youths ages 7 to 17 and $15 per family in U.S. dollars. For details, call 1-780-662-3640 or browse at www.history.alberta.ca/ukrainianvillage/.